A luxurious and well equipped holiday cottage in the Peak District National Park; close to Matlock, Bakewell and Chatsworth House. Post cottage is a superbly appointed 400 year old period four bed-roomed, stone cottage in the beautiful Peak District National Park. It has 2 en-suite double bedrooms, plus two further twin bedrooms. There is a beautiful lounge with stylish leather sofas, flat screen TV and DVD. The elegant dining room seats up to 8 people. 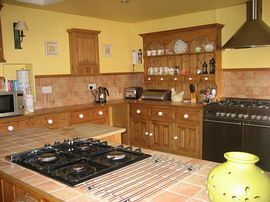 The large farmhouse, oak fitted kitchen/breakfast room has a professional gas range plus a separate hob, a microwave and dishwasher. Also there is a fridge/freezer, washing machine, tumble dryer and dishwasher. All linen and towels are provided. There is gas central heating throughout. Outside there is a landscaped terraced garden with garden furniture and barbecue. There is ample parking for cars outside the cottage plus off street parking for one small car. 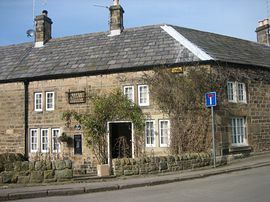 Post Cottage is situated in the beautiful Chatsworth Estate village of Beeley. Local pub, restaurant, village shop and tea-rooms are all steps away. The Peakland towns of Bakewell and Matlock with excellent shopping and markets are just a few miles away. There are plenty of attractions to visit, from the excitement of Alton Towers to the peaceful settings of nearby Chatsworth House and Haddon Hall. For lovers of the outdoors the area has everything - walking, cycling, fishing and more!. Miles of cycle trails can be explored on foot or bicycle. The Dark Peak moors and White Peak's limestone dales are all within easy reach. 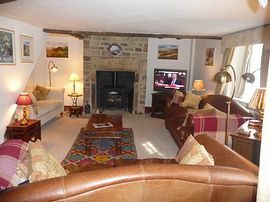 Luxurious Peak Distict Cottage sleeps 7. Local pub, restaurant, village shop with tea room. 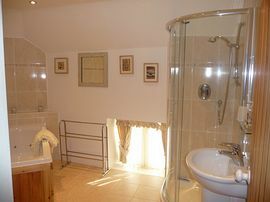 Downstairs bedroom and en-suite shower room. Linen and towels provided. Please provide your own linen for the cot. Off A6 between Matlock and Bakewell. Nearest motorway junction M1 junction 28. Open all year subject to availability. "Lovely cottage, super village location, the Devonshire Arms is our own personal favourite." "A well equipped and comfortable cottage in a nice area with plenty to do." "Only stayed here for a few days but loved every minute. The cottage is kept to a very high standard. "A really lovely place to stay. Feels like home. Definitely will come again. Thank you very much." 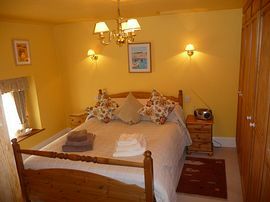 "Lovely, comfortable and well equipped cottage. Loads of character and attention to detail."